Originally a jeweller, who completed an M.A. in Jewellry and Silversmithing at the Royal Academy of Art, London in 1985, Susan Wraight maintained her scale, but switched mediums and skills and won the National Wood Design Award in the same year. She belongs to a western revival of an eastern tradition of miniature sculptures named Netsuke. 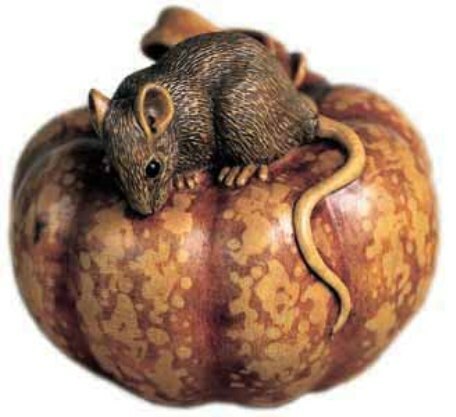 Japanese in origin, Netsuke were originally used as toggles and were worn between the Edo period 1615-1868. Trade with the west influenced the style of Japanese dress and eventually rendered the ceremonial Netsuke obsolete. 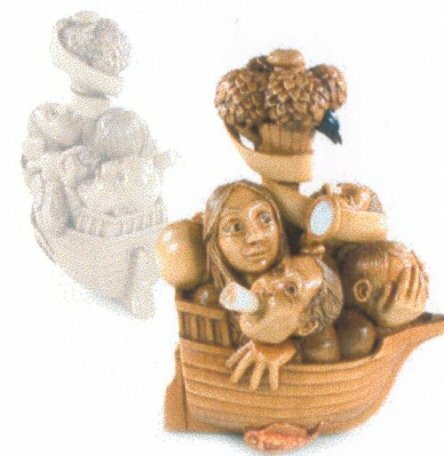 Susan Wraight embraces the spirit of Netsuke, however respectful of the tradition, she does not use ivory, nor does she engage in any of the customary themes associated with netsuke; flora, myths and fantastic beasts. Instead, she uses non-precious materials, especially wood, and draws on a western vocabulary, in particular our indigenous animal species. As a highly disciplined art form, custom dictates that works must be functional (portable), but not compromised as a work of art. Feathertail Glider adroitly illustrates Wraight's subtle union of Japanese tradition, refinement and discipline with an inventive expression of ideas and energy of western design, which has invested new life into an otherwise dying art practice. The form of Netsuke is paramount; Wraight's compact expression does not indulge in any unnecessary detail. The detail that exists is integral to creating texture, rhythm and movement. Despite the need for elegant restraint, the artist manages to imbue her work with an expressive, sensous and idiosynchratic quality. The smoothness and tactile quality conveyed by the pocket sized Feathertail Glider is responsible in estabishing an intimate interaction between the owner and the piece. Susan Wraight's miniature sculptures are distinguished from her Japanese predecessors by their bold design and expression. However, she has skillfully mastered the subtle, yet forminable art of revealing unique qualities possessed by individual creatures and forms. Her present work is focused on things that are hidden and are more ambiguous that traditional netsuke. Her investment in paradox is rewarded when she deliberately chooses a repellent creature, such as a snake and persuasively, but surreptitiously elicits its aspect of beauty. As Wraight asserts, "Netsuke don't shout - they whisper". The Office of the President, White House, Washington, U.S.A.
British Crafts Council, London, U.K. Contemporary Netsuke: Miniature Sculpture from Japan and beyond, Bowers Museum, U.S.A.
Out of this World: The Influence of the Natural World on Craft and Design 1880-1995,Craft Council Gallery and touring, U.K. Treasured Miniatures: Contemporary Netsuke from Japanese Collections, British Museum, U.K.; Los Angeles County Museum of Art, U.S.A.